The front cover has Nonaka Ai. 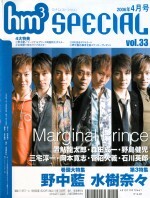 The back cover has Marginal Prince (Okiayu Ryoutarou, Morita Masakazu, Nojima Kenji, Miyake Junichi, Okamoto Hiroshi, Suganuma Hisayoshi, Ishikawa Hideo). There is a folded poster with Nonaka Ai on one side, and the Marginal Prince members on the other. 10 pages on Nonaka Ai, about her first album Ai no Uta. Ai is wearing a blue and yellow striped long sleeve sweater and 3/4 length wide pants. 7 page event report on Mizuki Nana's Livedom 2006 -Birth- (2006.01.21 at Nihon Budoukan). 4 page on Horie Yui. 2 page column (Aice5) by Asano Masumi. 2 pages on Nogawa Sakura. 2 pages on Tamura Yukari's Cutie Cutie Concert 2005 (DVD goes on sale 2006.03.08). 2 pages on Nakahara Mai, Shintani Ryouko, and Kojima Sachiko. 2 pages on Shimizu Ai. 2 pages on Koshimizu Ami. 3 pages on Clover (Inoue Nana, Shouji Yui, Miyazaki Ui, Saitou Momoko). 1 page on Koshimizu Ami, Itou Mika, and Sanpei Yuuko. 2 page interview with Hirano Aya. 2 page interview with Kusuda Toshiyuki. 2 pages on Tsuda Kenjirou. 1 page interview with Minagawa Junko. 1 page interview with Toyoshima Machiko. Her Christmas Live of 2005.12.23 will come out on DVD, 2006.03.10. 1 page interview with Saitou Momoko. 2 pages on Kuribayashi Minami. 2 pages on Shimono Hiro, Fukuyama Jun, Kishio Daisuke, Yoshino Hiroyuki. 2 pages on Konishi Katsuyuki, Sakurai Takahiro, Kasuya Yuuta. 5 page event report on Toriumi Kousuke, Yoshino Hiroyuki, Yasumura Makoto, Kishio Daisuke, Mizushima Takahiro. 8 pages on Marginal Prince. (Okiayu Ryoutarou, Morita Masakazu, Nojima Kenji, Miyake Junichi, Okamoto Hiroshi, Suganuma Hisayoshi, Ishikawa Hideo).